After publishing some really old pictures recently, today’s archive pictures feature a scene that many readers of this site will be very familiar with – that of a classic Blackpool tramcar at the Fleetwood Ferry terminus, preparing to depart with another service run to Starr Gate. The tram pictured is Ex-Towing Railcoach 679 - a tram which is currently stored at Rigby Road awaiting attention in the workshops to restore it to an operational condition. 679 was one of three English Electric Railcoaches which were rebuilt with flat ends as part of the Progress Twin Car programme, but which were never permanently coupled to their trailers and subsequently spent most of their lives running solo. For 679, this would last up to November 2004 when it was withdrawn, although it did emerge onto the main line once more in 2008 for a special farewell tour before entering preservation. These pictures, dating from the early 2000s, show 679 in a rather strange-looking version of the 1990s fleet livery which it received in 1999, featuring matt black window surrounds but no green skirt. In later years this was spoilt by the fitting of a replacement pantograph tower painted grey. 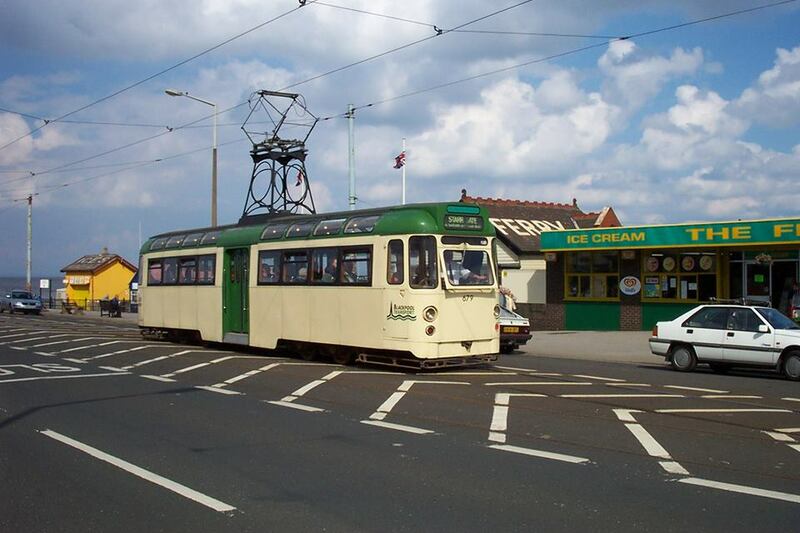 In 2004 the tram was painted in 1980s style green and cream livery but as mentioned above, its unexpected withdrawal at the end of the season meant that this did not gain much exposure. After being sold to the Lancastrian Transport Trust, 679 was supposed to be restored in its original guise with pointed ends for the tramway 125th anniversary celebrations in 2010 but, as with so many LTT projects, this remains incomplete some five years after the target deadline passed! 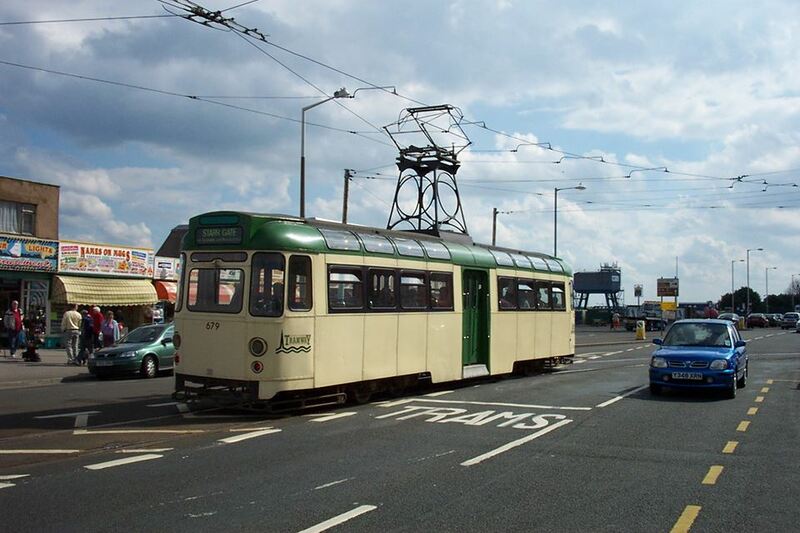 However, as the tram is now part of the Blackpool Heritage Trust collection, one day it will take its rightful place on the promenade again as Railcoach 279 which will look very different from the tram we know and love. A first look at 679 loading passengers at the old Fleetwood Ferry stop on the Esplanade itself, where passengers boarded trams in the middle of the road - a practice which incredibly lasted until November 2009. Although I have fallen into the trap myself several times previously, I was always taught to choose the written word carefully and before you make comments such as “but, as with so many LTT projects this remains incomplete”, I would urge you to do the same. For the benefit of your readers perhaps you can identify these “many” LTT projects and compare these to the successes like Coronation 304, Brush Car 632, Balloons 703 & 715, Rocket 732, OMO 8. All these projects were completed and enthusiasts largely enjoyed the fruits of the labour and funds devoted by a very small number of people, including substantial funding from myself. There are valid reasons why the restoration of Standard 143 and Railcoach 279 stalled, not all of which are in the public domain, and whilst I am aware that you have an axe to grind with the LTT, I would ask that you refrain from comments where you are clearly not armed with the full facts. Like you say, it will fall to the Blackpool Heritage Trust to now complete these vehicles when funds & workshop time permits. We must remember though that success is a child with many parents and when they are complete I would hope that the expenditure on both these trams that totals over £100,000 to date is recognised. Without this, the Heritage Trust would not be in the fortunate position of having these two high profile tramcar projects so near completion for everyone to enjoy seeing and riding upon when they do return to the rails. Seeing as you asked – Standard 143 and Brush car 259 immediately spring to mind, and the whole museum project didn’t exactly get very far did it? OMO 8 was made (just about) operational by Blackpool Transport so not sure whether that should count or not, especially as it needs further extensive work to be considered for use on the heritage service, and some of the others were tackled by either BTS, the Blackpool Illuminations Department or Beamish. Granted some good work was done but by promising the completion of various trams for specific dates of significance, disappointment was inevitable when the plans failed to materialise. Were not 632 and 715 repaints – hardly restorations? And 703 may have had a repaint but is now in long term storage at Beamish. And the Rocket restored by LTT? As for 143 and 279 being close to finishing – I don’t think so! And on the bus side, Ribble VR 1997, Ribble 1805 etc etc. Andrew is right the list of partly completed vehicles and missed deadlines and promises is a long one! You LTT contact prophecy proved accurate, as you say Paul D. In fact the only completed tram restoration the LTT delivered was Coronation 304 in 2004, eleven years ago. Then there are two incomplete ones 143 and 279, the rest being cosmetic refurbishments at best, largely through Blackpool Transport or Blackpool Council Illuminations dept and funded through shares or donations. Mr Higgs would do well to follow the advice he gave to Andrew – “…choose the written word carefully..” when “….not armed with (or forgotten) the full facts…”. As they say, criticism is something we can avoid by saying nothing, doing nothing and being nothing. What have the commentators achieved towards Blackpool tramcar preservation in recent years??? Well the amount of effort that goes into this website, helping tram preservation groups to promote their work to a wider audience, is a good place to start. Seriously though, it’s nobody’s business what I or any other enthusiast contribute to preservation – and plenty of us do so anonymously so as to help projects that we feel passionately about, but without wanting all the back slapping and ego boosting that could follow. That said, I did publicly donate money towards the repainting of a certain Boat car, thus enabling its return to service and raising its value, and therefore inadvertently making it an attractive prospect for export… so forgive me if I am a little more selective in choosing who and what to support in future! Well said Andrew, fully support every word you say. I too am struggling to remember what tram restorations LTT has itself actually completed. Fully agree about the publicity this site gives to various groups in their endeavours. Many contributors I am sure have done their bit at Birkenhead, Crich etc, and many others who lke me are for one reason or another unable to physically contribute have assisted financially where possible, including money donated to (wasted on where 605 was concerned?) the LTT, and will further contribute when the new Trust is completed, and I myself would say that Mr Higgs’ question re what have commentators achieved is possibly quite offensive to these people. You are absolutely right Andrew it is nobody’s business what you or any contributor to BTO does for tramcar preservation. The implication in Mr Higgs’s second posting seems to be that those making comments are all “keyboard warriors” that do not make a meaningful contribution is both patronising and inaccurate. Some will be observers, some will be involved in tram or other aspects of preservation. Some will be be directly contributing to tramcar preservation by financial or practical ways. All have a perfect right to make observations. BTO is to be applauded for its factual reporting and providing a forum for enthusiasts to express their often differing views. I note Mr Higgs uses an often used business quote in his original posting that “success is a child with many parents”. To slightly misinterpret the quote, its not usual for a parent to place their children in a position where they have to live outside for over twelve months at the mercy of the weather and vandals, and to sell one abroad to help pay for rent arrears on their building. He is right LTT will be remembered as one of the many parents, but not necessarily for the reasons he would like! This is all a little bit away from the original “679 Pictures in Time” article. Since the photograph a lot has happened, although the future for the tram now looks more secure. Useful reminder though of the perils of taking on a tram or trams when robust plans and finance are not in place to see it through. High profile public statements full of overblown PR hype are no substitute for demonstrating you can deliver on your promises!